This part of Fectio is about all the Roman sites I've seen over the past 30 years. Starting with the reconstructed remains of the German Limes in the summer of 1973 at the age of 9, followed by many more in The Netherlands, Germany, Austria, Switserland, Britain and even as far away as Isra�l. The image shows me during my first outing as a re/enactor in 1991. 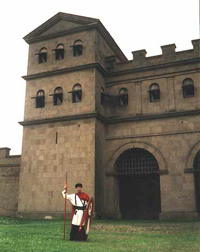 The tower is the north gate of the partly reconstructed Colonia of Xanten. I was invited by Time Team to come and have a look at their filming of the excavation of yet another Roman ship at Leidse Rijn near Utrecht. We heard on a new monument set up close to Utrecht and went to see it. This is a replica of stone to VIRADECDIS, a Tungrian godess. A visit to the newly discovered funeral memorial of TIBERIVS JULIVS PROBVS that was found in Houten and is displayed close to where I work. There was a great opportunity to see the big pit with the newly discovered Roman ship at Leidse Rijn near Utrecht. Of course we took it, taking the kids along. A 5th visit to the Archeological Park Xanten in Germany. This time, I showed it to my daughter (5) and my in-laws. A good opportunity to take a few snapshots of the kit as well! We visited friends in Switserland on a trip of just one week - but I managed to visit no less than 4 Roman sites! This adventurous search for the Wittnauer Fluchtburg or Refugium is the first. My first visit to the Archeological Park Xanten in Germany, together with two friends. Deep blue sea, deep blue sky, hot sand, ruins, .. and shops. Modern tourism has taken a firm hold of Caesarea Maritima, a.k.a. Herod's harbour. My trip to the still very impressive spot of the 2000-year old Heriodian development site. The site of Caesarea Philippi is still a very nice place to visit as its waterfalls are one of the sources of the river Jordan. On the shore of Lake Tiberias lies the Byzantine church that commemorates the miracle of the Multiplication of the Loaves and the Fishes. An unforgettable trip to the Judean desert. Masada, last refuge for the Jewish state, or simply a terrorist hideout? A place heavily laden with both historical and modern events. A troubled history that goes back thousands of years. A deeply divided city, coveted nonetheless by peoples from all over the world. And once destroyed and rebuilt by the Romans. On a bicycle tour through Britain we camped below the ramparts of Old Sarum, the ancient fort just north of the modern town of Salisbury. Hardly a visit, to remains which weren't much to look at. The Milestone next to the road to Bruneck was something different. After visiting Aguntum, we visited the settlement which sprung up after the town declined at the onset of the Dark Ages. Lavant has a nice ruin of a Bishopric which lasted until the late 6th century. No one in my family could tell me when or where exactly these fuzzy pictures were made, just where we went on holiday that year. It took some detective work. The next site on that first holiday, a spot on the R�tische Limes near Ellwangen. 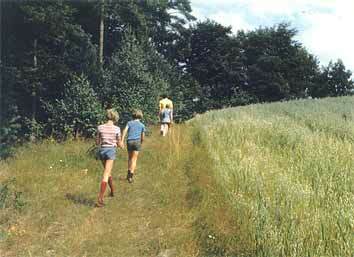 I was but 9 years old when a holiday took me to the Obergermanische Limes in Germany. I was completely addicted to everything Roman after that. Beware of horrible pictures. VortigernStudies is copyright � Robert Vermaat 1999-2008 . All rights reserved.